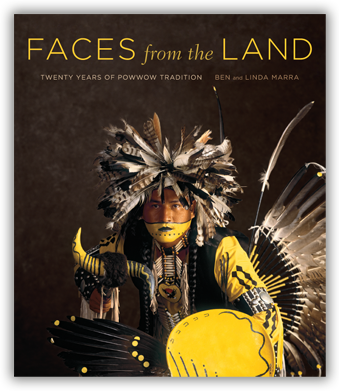 After the success of Powwow, this new book by Ben and Linda Marra presents more photographs and testimonies of the dancers, who, united by the ageless rhythms of the powwow drums, continue to preserve tribal traditions. To capture this vibrant collection of portraits, photographer Ben Marra and his wife, Linda, traveled to powwows across North America, documenting the brilliant colors, incredible craftsmanship, and personal significance of the regalia worn at these events. The outfits are a source of pride for the individuals wearing them–heritage, family, tribe, and culture are woven into the dancing dress as inextricably as any thread. Each dancer also recounts his or her own journey to the drum circle. In Faces from the Land, one thing becomes clear: A new generation of Native Americans is determined and honor-bound to keep the dancing tradition alive. Working together as photographer and producer/ documentarian respectively, Ben Marra and his wife, Linda, began to document powwows in 1988. The Marras’ ongoing photography project includes a traveling exhibit for museums, two yearly calendars, fine art photographs, lithographic art prints, and an earlier book, Powwow: Images Along the Red Road. They live in Seattle, Washington. 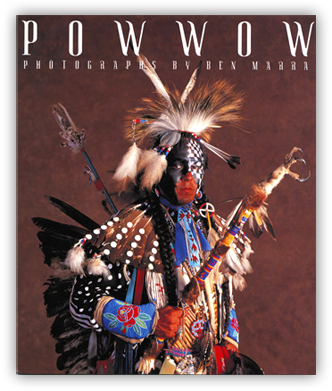 This book presents a gallery of stunning color portraits of powwow dancers in full regalia—with personal comments from dancers about the meaning of powwow in their lives, links with family, tribal and cultural traditions, and the spiritual significance of the drum, the dance, and the song. the very word conjures up the proud connections American Indians have with their long heritage. Far from being mere entertainment, powwows resonate with the traditions of the Native American experience. Photographer Ben Marra has captured the strength of those traditions in a series of striking portraits of the men, women, and children who embody the spirit and intensity of these multi-tribal celebrations of native song and dance held throughout North America. Resplendent in their feathers, buckskin, and beaded regalia, these dignified, serious, but joyful powwow participants present themselves before Marra’s camera to share pride in their identity as American Indians, to demonstrate the richness of their outfits, and to pass along their ancestral ways. Most of the portraits are accompanied by statements from the subjects gathered by Ben’s wife, Linda. The dancers tell of their childhood introductions to powwow life, the meaning of their elaborate, lavishly detailed attire, and the sense of intertribal community that comes from participating in powwows. Many also choose to voice their commitment to walking along the “Red Road,” that is, free of alcohol and other substances—a code that guides all powwow participants. Spoken or written from the heart, the subjects’ sincere words add another dimension to the stunning photographs, portraits of a people with a common history who have found solidarity, comfort, and joy in their ancient traditions. "The power of a portrait comes from the interaction of photographer and subject. Without mutual cooperation such images lack integrity and dignity. I have never seen a Marra portrait of a reluctant, embarrassed, or hostile subject. The people he photographs look into his camera and trust him to bring out their individuality and confidence in their milieu. Thank heavens for photographers like Edward S. Curtis and Ben Marra. They have enriched our visual heritage of American Indians and offer an enduring tribute to their subjects."